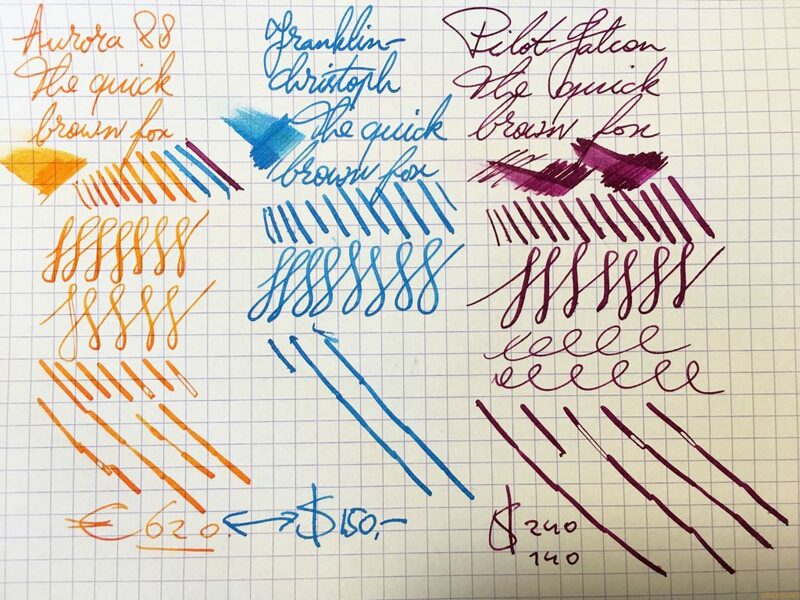 With all the new flex nibs hitting the market recently, I thought I would compare the Aurora 88 with the brand’s new 14k “vintage flex” nib, the Franklin-Christoph Model 66 with the new 14k flex nib, and the good old classic Pilot Falcon (metal body) with 14k flex nib. Let’s see how these three nibs fare face-to-face. This entry was posted in Fountain Pen Shootout, Fountain Pens, Nibs and tagged 14 Flex, Aurora 88 Flex Nib, flex writing, fountain pen shootout, Franklin-Christoph Flex Nib, Modern Flex Nibs, Pilot Falcon on July 24, 2017 by sbrebrown.